It is with great pride, hope and excitement, that I introduce to you the Gavin R Stevens Foundation. We had our first board meeting with our new board of directors this past Friday. It was a long 3 hour session, but we had a lot of details to hammer out. I am ecstatic about the future of the foundation, and the change we hope to bring. 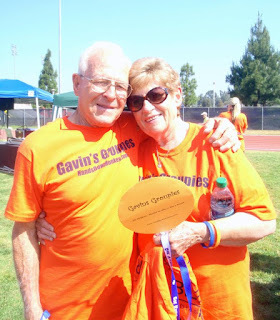 When we were first given Gavin's diagnosis, I was lost. There was literally NO WHERE to turn for support, resources, etc. Everything that we found, was on our own. We didn't know anything about the disease, LCA. We didn't know anyone who was blind, and the list of unanswered questions grew each day. In the back of my mind, even during the very sad moments, I knew this day would come. I didn't have the knowledge or the strength to do it back then. I don't think any of us did. We have grown, we have accepted, but that doesn't mean that we cannot be a contributor to change. Our mission is to raise awareness and funds of LCA. While doing so, I would like to promote braille literacy, be a support group for other families, to share information. The list goes on, but the main focus is to raise awareness and money. We will be operating as a full 501-c3 non profit organization. All of our money raised will be going specifically to research for LCA. We have a lot of work to do, and this is a ginormous undertaking. I am so proud of my family who has stepped up to help us with this, and our tremendously gracious friends who are by our sides showing their support. LCA is a very rare disease. That does not mean that we can not be a part of the big picture of the treatment of the disease. Gavin may or may not ever have treatment for LCA. He may posses the gene that may never be able to receive gene therapy. He one day may be able to have treatment, no one knows at this point. What I do know is, I can not sit back and not be an active participant of the big picture. If this benefits other families, and children and individuals with LCA - then we have done our job. We have come a long way, and it has not been easy. You can read through the archives to see our progress, and to say that it has been a journey, is an understatement. I am proud of our next step. I am thankful to Gavin for giving us the strength to move forward. He is our inspiration, and a part of the bigger picture that I don't even fully understand yet. Thank you again for your generosity and kindness. I pull strength from knowing your interest is here with our mission, and with Gavin. 1) We are still waiting on the results from Gavin's tests from the Carver Lab. I checked the status, and looks as though things are moving, but no answer just yet. And so we wait. 2) We leave for Philadelphia in about a month. We will be leaving the kids behind. We decided long ago it would be best to leave them, for a number of reasons. One of those is NOT that I wanted to. Which leads to point 3. 4) MUSIC, MUSIC, MUSIC. The words repeated in this house, day and night. All Gavin wants is his music (yes, I know I have talked about this before). As he gets older, the need gets greater, his singing becomes more in tune. Family members who don't see him all the time, are starting to see what I am talking about. It's pretty incredible. Speaking of which, a Professor of Music at Roehampton University in London, England is conducting a study on music and children with LCA. It was pretty weird answering the questionnaire he sent to me for Gavin, because I really got to see how often and through daily activities that music is such a big part of our lives. All the info was submitted, and I'm looking forward in time reading about his findings in this study. 5.) In other news, Landon is no longer a Kindergartner. *cry* Where he is going to school next year is still up in the air. He may continue at the same school, but there are some things I am not happy about, and he is on a waiting list for another. The thought of homeschooling, is really not far from my mind. But THAT is for another discussion and post. 6) SUMMER! It's not my favorite. Ok, I enjoy being able to have late night BBQ's, and all the fun activities that summer brings, but the roasting temperatures are NOT my favorite. I'm not much of a beach person, I enjoy it, don't get me wrong -- but I would rather be in the mountains near trees and a running creek or in some wide open greenery (need to move to the country). I know, weird! But, this summer I am excited. Gavin is at a good age to have him explore new things this summer, and for that I am looking forward to summer. (Shh... really, I enjoy summer because it's just that much closer to Fall). Kidding? Not. 7) Sorry this isn't much of an in depth post. I had a few small Gavin things, but nothing too much to elaborate. On a side note, did you see the new building dedicated at Children's Hospital in Philadelphia? WOW!!! It's these new, updated facilities that will hold the cure for so many children in the way of gene therapy. There are other departments within the building, and I couldn't be happier knowing how much centralized research will take place to help so many children with many different diseases. 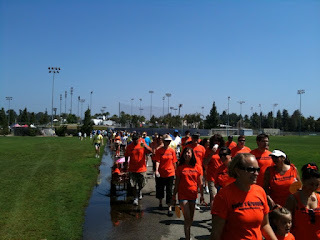 This past Sunday was VisionWalk in Orange County. It was our second year taking part of this event, and my first year as Walk Chair. I was very honored to be asked to be the Orange County Chair and be on the board for the Foundation Fighting Blindness. 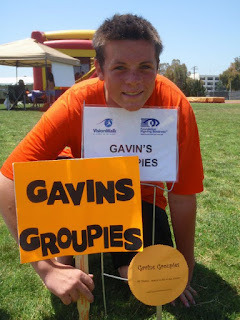 Gavin's Groupies to date has raised close to $13,000 and about 150 walkers. Our original goal was $9,000. I am so proud of our team, and all of the creative, unique ways people have come up with trying to help us reach and exceed our goal. The goal here is to raise money for research. 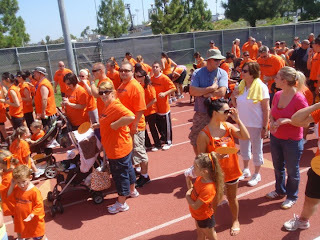 Our particular VisionWalk in OC, has a goal of $100,000. 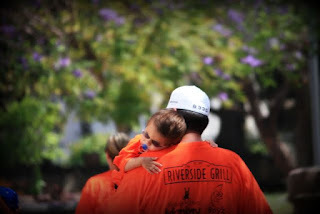 80% of what is raised for VisionWalk goes directly towards much needed research. Very recently the foundation funded some very critical clinical trials. Beyond the thank yous, and beyond the hugs and admiration to all my fellow groupies, I would like to pour my heart out for a minute if I could. 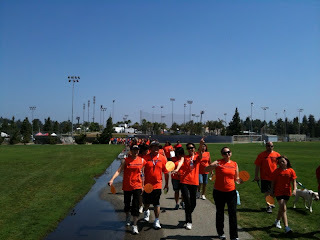 VisionWalk goes past getting a group together and walking to take a stand against blindness. For me, it was my saving grace. Let me explain. I highlighted this in my speech in a sentence or two on the day of the walk. I found myself getting emotional when I started to talk, so I had to stop and retract. Once I get to tearing up, there is no going back for me. I am a crying fool! So I touched on this, but didn't quite get into details. My family knows, but for those that may not, I will try to sum it up as best as I can. Last year, in February, we received the diagnosis of Gavin. Or better yet, a confirmation that our suspicion was right. We walked into the pediatric opthalmologist appointment with of course reassurance from everyone that we were wrong. We walked out 2 hours later, with the words of the doctor ringing in my head "there is something terribly wrong". We didn't know if there were other problems with Gavin at that point. If a neurological disorder was causing his blindness, if there was an infection, brain tumor, cancer or the list of many, MANY other problems. Further tests were needed. We were crushed beyond crushed. I remember sitting in my car after the appointment, and slumping into my seat, feeling completely defeated, even more confused and beyond heartbroken. I literally was numb, and could not move. Little did I know, the months following would prove to be even more devastating with family tragedy. To the internet I took for more research. There is no manual, protocol or even a support number made available to you when you walk out of that doctors office. Where do we go from here? Just wait around for the next appointment? A plethora of questions, a lack of resources, and some hacking at the keyboard brought me to the Foundation Fighting Blindness. I was not strong enough at this point to even begin to talk to people about what was going on, let alone thinking of fundraising, raising awareness and being a part of a group. I was trying to digest my feelings, figure out what goes on next as far as therapy services, early intervention services, his next appointment, his blood work, more tests and more doctor appointments. I was at the lowest one can imagine, emotionally and spiritually. I just didn't understand? Through the hacking at the keyboard, I did find out that FFB was having it's VisionWalk in a few months. I talked to Troy and informed him this may be good for us. We pondered back and forth for a few days, and my lows were getting lower. I had to do something. I signed up myself, Troy, Landon and Gavin. Came up with Gavin's Groupies as our team name and that was that. Within a month we raised $5,000 and by the day of the walk, we raised $9,000. We gained recognition for the largest team and most money raised on the day of. Mind you, I was STILL struggling. Everyday. My breakdowns at that time were daily, and for extended periods of time. Today, something will hit me, and I can talk myself through the sadness, with just a tear or two. Last year, my breakdowns could last hours at a time. I feel that we were able to turn our tragedy in our hearts to a triumph of the soul. Focusing on the overwhelming support for our team last year helped to make me stronger. The little snippets of pleasure by seeing a donation email come in, or someone join my team, or an email of encouragement helped to put aside the sadness. You can't get rid of it. It is a sadness for your child, out of your control and out of the grasps of what you can instantly do to make it better. But slowly, the energy began to build. The hope factor began to elevate, and it all began to occupy my heart, and in a sense take over the sadness. I began to learn that this was all helping me. VisionWalk began to heal me, personally. We were able to focus on the positivity, our conversations were around who was joining our team and the energy again started to build. I began to learn that sharing Gavin's story, also helped. This blog helped. Sharing links on Facebook, helped. It made me stronger. Little by little, I was getting pieced back together. My heart was starting to mend and I could see a glimpse of the future with us trying to bring change. 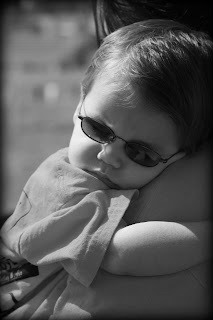 VisionWalk was a part of the missing puzzle piece the day we received his diagnosis. One of the lowest days in the history of my life so far, it was a piece that I couldn't even comprehend to bring into my life. I wasn't ready to not only want to understand what was wrong with my son, I wasn't ready to face it, stare it down, or accept it. VisionWalk helped to make this happen, as silly as that sounds. 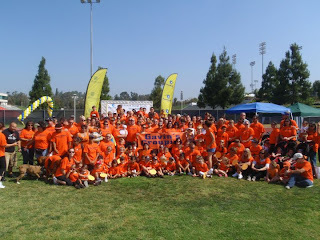 So on this past Sunday, when you put on your orange shirt and walking shoes, and made your way to Cal State Fullerton, please know that you are part of a much bigger picture for me. You are healing me. Each step you take with us, ironically, is a step closer to my heart being better, stronger and ready to take on the next step. Each individual person brings that strength. There is truth to the adage 'strength in numbers'. Even if we don't bring a cure to Gavin, we WILL bring change. Change in awareness. Change in the way others can appreciate the value in being able to visually navigate their life. That is what VisionWalk means to me. It is more than a group of people walking a few miles, it's more than me trying to greet every one of you at the walk, it's more than me being asked to be walk chair, or give an interview or a speech. It is much, much more. It's me facing the fact that my son cannot see it all. 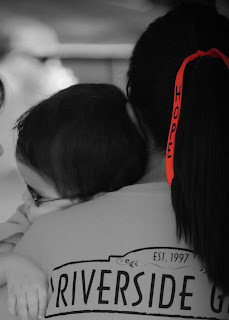 It's facing it with you by my side, and behind me... giving me the strength to be the best mom, advocate and most stubborn person in the world, because I will not let this get this best of us. And we will not go down without a fight. You are a part of my strength to fight that fight. You are a part of the bigger picture. You help to make up where I lack; and I am speaking on behalf of my entire family.